There are two paths to achieve ketosis. The first is through the ketogenic diet or fasting, which can take weeks or months for the body to produce its own ketones. The second is through exogenous ketones like HVMN Ketone, consuming ketones through an external source. On the map to ketosis, these are different roads–one more winding than the other. But how do you know you've arrived at ketosis? What positive things are you looking for? What negative symptoms might you encounter? Here, we discuss what signposts to monitor your ketosis. Ketosis is a normal metabolic state marked by higher-than-normal levels of ketones (or ketone bodies) in the blood. Endogenous ketone production denotes ketones produced naturally by the body. It's the body’s natural adjustment to the absence or restriction of carbohydrate in the diet. Without enough glucose from carbs to fuel its cells, the body turns to fat to replace glucose as its primary source of energy. In the liver, fat that is not burned for energy directly is converted to ketones. This means that you are in a ketogenic state. Ketone levels increase in the bloodstream and provide an alternate and efficient fuel source for the body and brain. As a result, muscle protein is spared from being converted to glucose for energy. Exogenous ketosis comes from an external source. Consuming exogenous ketones, like a ketone drink containing a ketone ester or a ketone salt, raises blood ketone levels. The body isn't producing ketones in this state, but still remains in ketosis from having ketones introduced from an outside source. However, the body isn't ketogenic–that specifically means the body is producing its own ketones. Two paths, one destination. Here's what to look out for to ensure you're in ketosis. 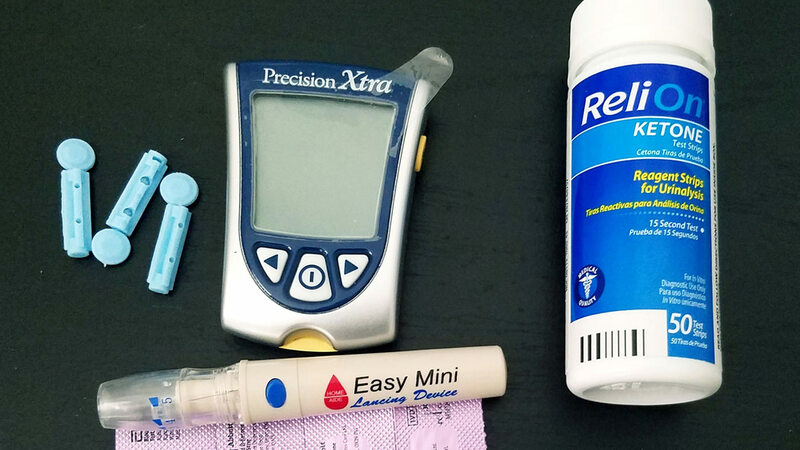 A blood ketone level of 0.5 mmol/L is widely acknowledged as the threshold for entering ketosis.1 Using a measuring device is the best way to know you're in ketosis, with different devices measuring the presence of ketones in the breath, blood and urine, to provide an exact biomarker of your level of ketosis. The ketogenic diet remains the most common approach to trigger a state of ketosis. Low in carbs, high in fat and low/moderate in protein, carbohydrates are typically reduced to less than 50 grams per day. It's this depletion of carbs that result in the body becoming ketogenic. Along with biomarker testing, subjective symptoms can provide an indication of your ketosis. Sometimes, early side effects of the diet result from carbohydrate withdrawal. This can be known as the "keto flu;" symptoms include nausea, fatigue, headache and dry mouth. They're short-term, typically lasting about a week or less. Keep in mind, however, that we are all different. Our bodies react in different ways. Some of us may experience these symptoms later than sooner, to a lesser extent, or not at all. Let's dive into some of the other potential side-effects of ketosis. Glycogen is the body's stored form of carbohydrate for energy. It's found primarily in the liver and muscle cells. Each gram of glycogen is bound with 3 to 4 grams of water.﻿3 On a low-carb diet, the body will burn through these glycogen stores, releasing a lot of water and causing frequent urination. As insulin levels plummet from carb-cutting, more water is flushed out, along with excess sodium (in contrast, excess insulin from carbs causes sodium and water retention).4 In some people, dehydration contributes to constipation, which can also result from avoiding fiber-rich carbohydrate foods. While less common, diarrhea or loose bowels can be triggered by a number of factors including too much or too little fat, dairy intolerance, or changes in gut flora. Many people on the ketogenic diet never experience gut problems. Those that do can try combating them by drinking plenty of water and mineral-rich broths, and eating more non-starchy veggies along with foods rich in fat and fiber (such as nuts, nut butters, and avocado). As glycogen stores become depleted and water attached to glycogen is released, rapid weight loss in the form of “water weight” occurs. Surprisingly, low-carb diets may lead to bad breath (also called ketosis breath). After several weeks of keto dieting, ketosis breath typically dissipates. To help, drink more water and use breath fresheners. If it's unbearable, consider adding just enough carb back into your diet to avoid bad breath while still staying in the ketosis zone. The positives of ketosis greatly outweigh the negatives when reaching a state of ketosis. Lowering carbohydrate intake is responsible for some of the side effects of the diet, but is also responsible for the positive effects (from the presence of ketones). Increased mental clarity and focus, and less brain fog, are often reported by healthy people in ketosis. HVMN CEO, Geoffrey Woo said, “after a drink of HVMN Ketone, it’s like I’m more behind my eyeballs.” Exogenous ketones can subjectively improve mental performance and clarity. When HVMN Ketone was tested in mice, they performed 38% better on a maze solving challenge, so it's possible there may be a cognitive boost for humans also.9 While following a ketogenic diet, you avoid the energy peaks and troughs that come from quick-energy carbs. Producing ketones from stored body fat provides the brain with a steady, sustainable supply of fuel. One of the first symptoms you might notice when on a ketogenic diet is that it kills your appetite. In nondiabetics, ketosis (also called nutritional ketosis) is regulated and controlled in the body so that ketone levels never reach the harmful levels associated with diabetic ketoacidosis. Ketoacidosis is an acute, life-threatening condition that occurs in severely uncontrolled diabetes (mainly type 1) when ketones rise to massive, supranormal levels. Importantly, this dangerous condition is rare in non-diabetics following a ketogenic diet, and in people taking exogenous ketones. Sticking to the recommended dose of max. 3 drinks per day of HVMN Ketone, there is no risk of ketoacidosis. Ketosis is the body’s normal physiological response to a shortage of carbohydrate fuel. It is characterized by elevated blood levels of ketone bodies, or ketones. Ketosis is a healthy, natural state that shouldn't be confused with ketoacidosis, a dangerous and potentially life-threatening complication of diabetes. Elevated blood ketone levels is the sign of ketosis, while certain subjective symptoms can also signal ketosis. Increased mental clarity, less brain fog, and diminished appetite are fairly common among people in ketosis. The ketogenic diet specifically has its own assortment of symptoms. Fortunately, the negative symptoms such as constipation, diarrhea, and bad breath are often temporary and tend fade as your body becomes better at fat burning and naturally producing ketones. The positive symptoms of ketosis coincide with higher levels of ketones in the blood. This may occur after several weeks of adhering to the ketogenic diet or very shortly after ingesting exogenous ketones. How do you achieve ketosis? We’re actively investigating BHB. Be first to know the results. HVMN is working with several research organizations to conduct human studies on the benefits of BHB. Everything from sports performance to mental benefits to medical use cases are being explored. Subscribe to be on the cutting edge of that science. 1. Paoli A, Rubini A, Volek JS, Grimaldi KA. Beyond weight loss: a review of the therapeutic uses of very-low-carbohydrate (ketogenic) diets. European Journal of Clinical Nutrition. 2013;67(8):789-796. doi:10.1038/ejcn.2013.116. 4. DeFronzo RA, Cooke CR, Andres R, Faloona GR, Davis PJ. The effect of insulin on renal handling of sodium, potassium, calcium, and phosphate in man. Journal of Clinical Investigation. 1975;55(4):845-855. 5. Paoli, A., Bianco, A., Grimaldi, K.A., Lodi, A., and Bosco, G. (2013). Long term successful weight loss with a combination biphasic ketogenic Mediterranean diet and Mediterranean diet maintenance protocol. Nutrients 5, 5205-17. 6. Musa-Veloso, K., Likhodii, S.S., and Cunnane, S.C. (2002). Breath acetone is a reliable indicator of ketosis in adults consuming ketogenic meals. Am J Clin Nutr 76, 65-70. 7. Evans M, Patchett E, Nally R, Kearns R, Larney M, Egan B. Effect of acute ingestion of β-hydroxybutyrate salts on the response to graded exercise in trained cyclists. Eur J Sport Sci. 2018:1-11. 8. White H, Venkatesh B. Clinical review: Ketones and brain injury. Critical Care. 2011;15(2):219. doi:10.1186/cc10020. 9. Murray, A.J., Knight, N.S., Cole, M.A., Cochlin, L.E., Carter, E., Tchabanenko, K., Pichulik, T., Gulston, M.K., Atherton, H.J., Schroeder, M.A., et al. (2016). Novel ketone diet enhances physical and cognitive performance. FASEB J. 10. Gibson, A.A., Seimon, R.V., Lee, C.M., Ayre, J., Franklin, J., Markovic, T.P., Caterson, I.D., and Sainsbury, A. (2015). Do ketogenic diets really suppress appetite? A systematic review and meta-analysis. Obes. Rev. 16, 64-76. 11. Stubbs BJ, Cox PJ, Evans RD, Cyranka M, Clarke K, De wet H. A Ketone Ester Drink Lowers Human Ghrelin and Appetite. Obesity (Silver Spring). 2018;26(2):269-273. 12. Manninen AH. Metabolic Effects of the Very-Low-Carbohydrate Diets: Misunderstood “Villains” of Human Metabolism. Journal of the International Society of Sports Nutrition. 2004;1(2):7-11. doi:10.1186/1550-2783-1-2-7.